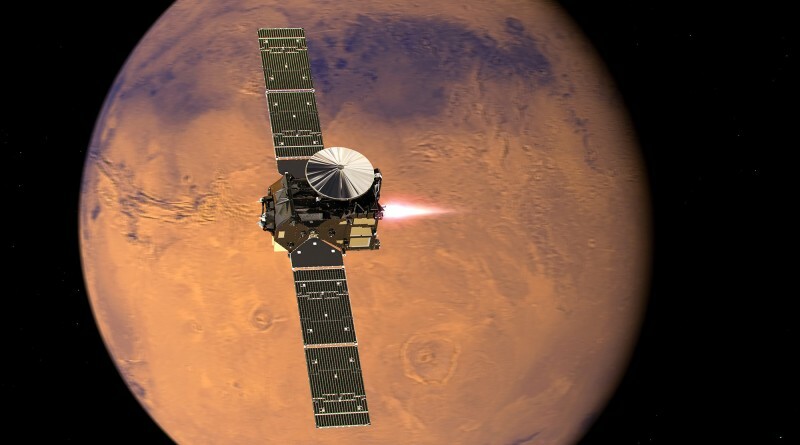 The Trace Gas Orbiter, TGO for short, arrived at Mars back in October after a half-year interplanetary cruise, firing its engine for nearly two and a half hours to hit the brakes in order to be captured in orbit around Mars. TGO’s critical orbit insertion maneuver was a complete success and ESA said the spacecraft achieved an orbit of 250 by 98,000 Kilometers, inclined seven degrees to either side of the Martian equator. 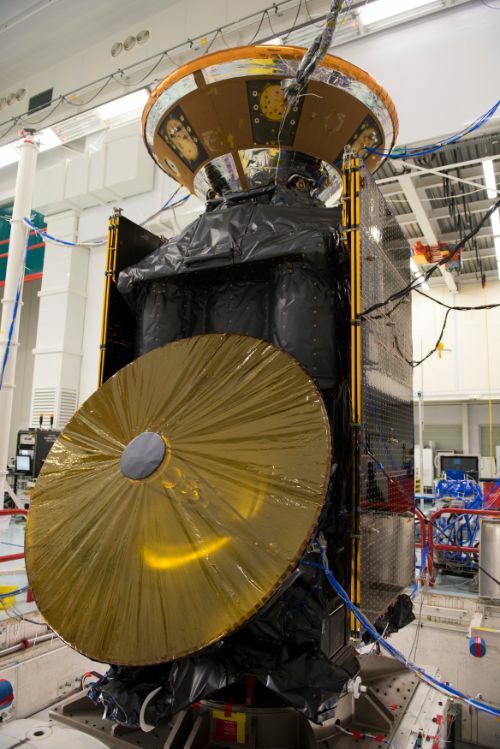 Taking 4.2 days for each lap around the planet, TGO completed a pair of science checkout orbits in late November, exercising the spacecraft’s imagers and spectrometers to ensure the cutting-edge instruments were in good shape, also providing valuable data for fine-tuning of the instruments over the coming months before science data acquisition can begin in earnest. One final hurdle that has to be passed before putting TGO’s instruments to work is placing the spacecraft into its planned science orbit. 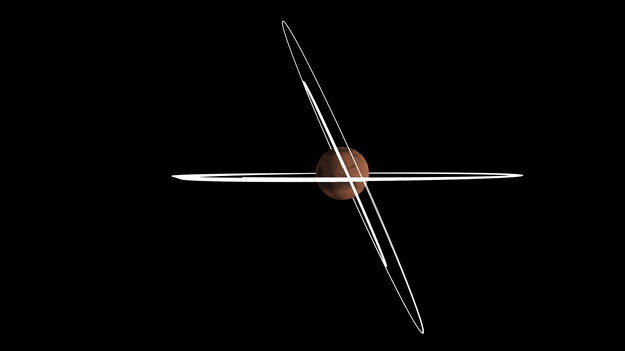 The low inclination of the initial capture orbit was the result of the attempted landing of the Schiaparelli demonstrator module in Meridiani Planum near the equator, also taking into account the required position of TGO at the time of the landing to capture signals sent by the descending craft. These signals proved out vital in the investigation into the unfortunate failure of Schiaparelli’s landing at the point of parachute descent. TGO’s orbital adjustment has been set up as a two-stage effort starting with a propulsive plane change followed by a lengthy period of aerobraking for altitude reduction. 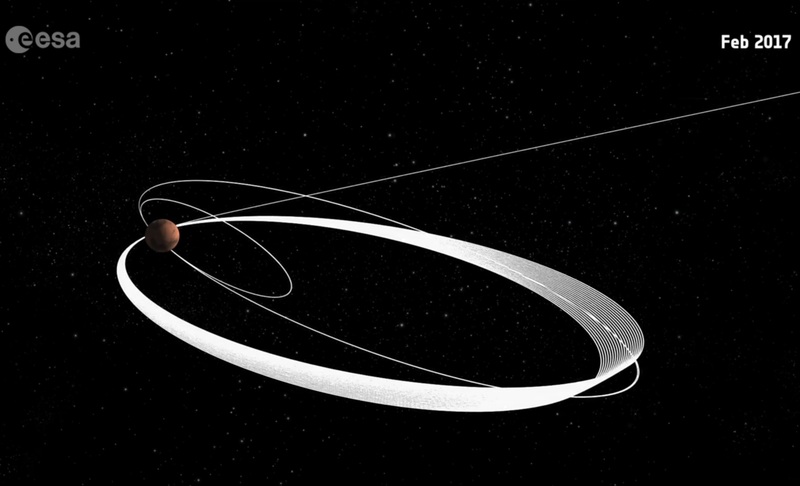 The initial inclination of seven degrees is not of much use for science as it would only allow the orbiter to cover a small band around the equator – requiring a significant plane change to position TGO into an orbital trajectory covering the majority of the planet. Therefore, TGO brought sufficient propellant for a series of plane change maneuvers, firing its 424-Newton main engine out-of-plane in order to increase the orbital inclination while also shaving off some apoapsis altitude. Engine firings were performed on January 19, 23 and 27 with very high precision according to tracking data gathered after each maneuver. A small trim maneuver was carried out on February 5 to fine-tune the orbital inclination and lower the periapsis altitude from 250 to 210 Kilometers in preparation for future operations. Still in a highly elliptical orbit around Mars, TGO is now set to head into an aerobraking campaign of around 13 months picking up in mid-March after another series of science calibration passes. 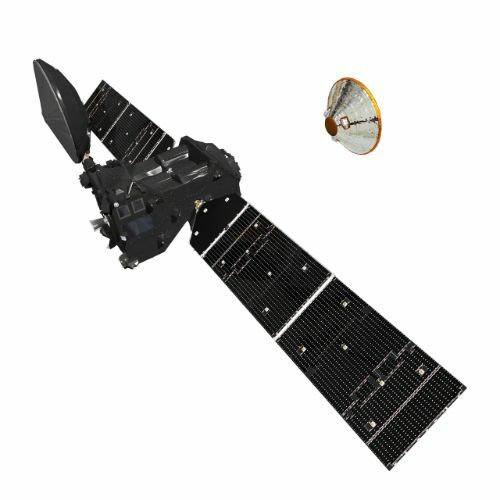 Aerobraking has been chosen over a propulsive apoapsis reduction given the limitations of fuel mass imposed on the mission and the desire to preserve as much propellant as possible for later mission phases. 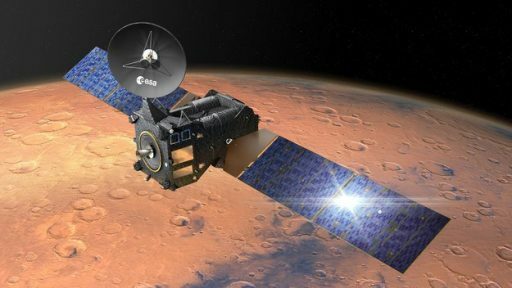 Aerobraking will be completed by stepping down the periapsis altitude to have the spacecraft skim the outermost layers of the Martian atmosphere with the solar arrays acting as drag brakes. With each successive pass through the atmosphere, the apoapsis altitude will be lowered. Successful aerobraking requires a lot of finesse in setting up the low passes, walking on a relatively fine line between efficient braking and potentially hazardous aerodynamic environments for the spacecraft. Frequent tracking data will be obtained after each pass to ensure the spacecraft remains on a safe trajectory at all times. 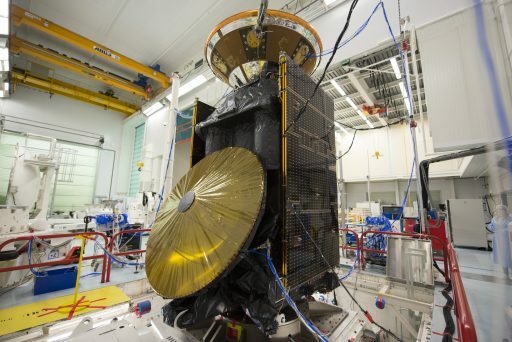 Aerobraking is budgeted for 13 months with a two-month break to wait out a solar conjunction in July/August 2017, however, there is some uncertainty of up to several months depending how efficiently the aerobraking campaign goes. The start of TGO’s four-year science mission is expected in 2018. TGO also acts as a communications terminal in Mars Orbit, outfitted with Electra radio units that can receive data from Mars surface missions. 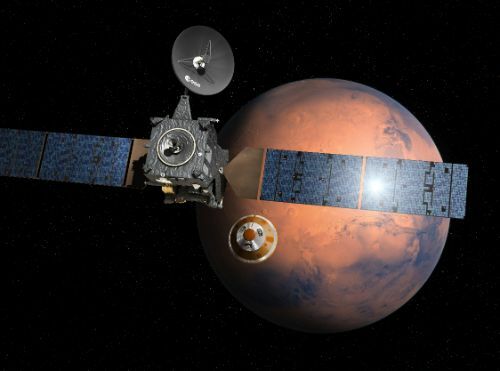 Once in its regular science orbit, TGO will complete regular communications sessions with NASA’s Mars Rovers as well as the ExoMars 2020 landing platform and rover once they arrive on Mars.